TEAM POLSELLI is a group of professionals who use our products and who stand out for their professional skills. 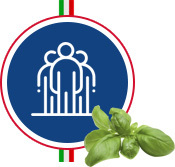 Being part of this group means getting in touch more easily with the public of fans of good food with news, images and videos made during the events in which our company participates both in Italy and in foreign countries. Being part of TEAM POLSELLI means being ahead of others. You will have the opportunity to participate in technical and professional updating activities that our laboratory and our Academy organize during the year, preview new products and participate in the most important international events. All this translates into professional growth and greater visibility. Thanks to the collaboration with our distributors, we select professionals who stand out for their ability to do their job well.